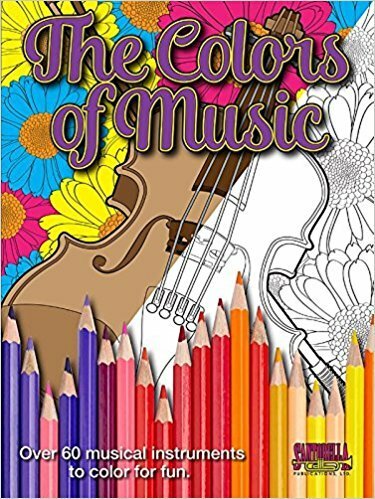 Experience the high quality you've come to expect from Santorella Publications in The Colors of Music, with over 60 musical instruments depicted with intricate background patterns. Each image is printed on heavy stock on only one side of the page to avoid bleed-through. Printed in the larger 9 x 12 size, with lay-flat binding, the book is designed to last for years, while each page is perforated for easy removal and coloring. Every illustration will become a one-of-a-kind original piece with your personal touch and a work of art truly suitable for framing. From the dawn of time, coloring has been one of the most basic forms of self-expression and is often the first creative process which many of us experience. Taking an existing image or pattern and making it our own is a uniquely personal experience. We decide which creative implements to use, perhaps crayons, pencils, or markers, and which colors to apply. As we color, we find we are in control of the entire process, limited only by our imagination, and when we are done, we have an artistic embodiment of our own personality, as unique and individual as each of us is to the other. It makes no difference if we are relatively skilled or unskilled; we express what is in our heart and mind each and every time we set pencil to paper. As we become more experienced and skilled, we acquire the power through technique and style to more freely express what is so clear in our imagination. In time, our creations become freely expressed works of art. The same can be said of music. The musician chooses their instrument, then takes an existing pattern of melody and chords and adds unique "colors" to them to make that piece of music uniquely their own. As musicians, we practice to become more experienced in order to acquire the skills to more freely add our own brand of expression and style to the music. Both of these art forms have creativity at their core. They allow the artist or musician, both young and old, to freely express feelings within while providing a sense of joy, tranquility, and meditative focus. The Colors of Music literally reminds us that art and music are "on the same page." This trend-setting series, by Santorella Publications, will provide both the artist and musician with yet another creative channel for self-expression and individualism. Amateur and professional alike will also appreciate the opportunity for some much-needed downtime from the hard work of practicing, or simply the rigors of everyday life, while still being able to enjoy the art form they love. After all, creating art and music is supposed to be fun.